Mental illness and remarkable creativity, genius or even sometimes walking hand in hand. Of course, not every person with schizophrenia or depression becomes a famous artist or a mathematician, but also an ordinary mentally ill man takes his disease to places where mainstream "healthy" society does not have access .. I glimpse into the lives of famous "fools" we can make sure that these sites can really make a lot of varied wealth. People working in creative professions are often treated for any mental illness. Families possess loaded schizophrenia or bipolar disorder (it is a disease where the human alternating bouts of depression phases with enormous confidence and zest for life) have among its members more artists and scientists than would correspond to the average of the general population. Writers have about fifty percent higher risk of suicide than the general population. Asperger's syndrome as a ticket to the club geniuses? This disease can be described as a milder form of autism. People with Asperger syndrome are poorly versed in interpersonal relationships, understand body language or facial expressions. What they lack in social skills, but is sometimes compensated elsewhere. 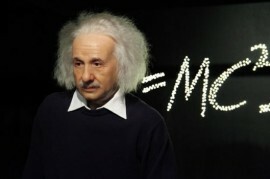 Some experts speculate that he suffered from Asperger's syndrome, the famous physicist Isaac Newton or Albert Einstein even. Even if Albert Einstein had close friends, romances with women and was also interested in politics, according to some experts, this brilliant scientist showed signs of Asperger syndrome. One piece of evidence they claim to be Einstein's lectures, which were exceptionally confused, and when it all listeners gave up and left, the genius continued lecturing in front of an empty room. Schizophrenia is a severe mental disorder that destroys the lives of many people. At the same time, however, sometimes connects with exceptional performances in soil science or art, as we can see in the example of the famous mathematician John Nash or musician and founding member of Pink Floyd Syd Barrett. Mathematician John Nash is known by most of the public through the film A Beautiful Mind, which was largely inspired by his life story. Nash's work, in fact, affected the lives of all of us, without us today have no idea. In 1994 he received along with two other experts on the theory of games Nobel Prize in economics. Bipolar disorder is one of the most common mental disorders with which to contend (only) famous personalities. A history knows many who gave up their fight prematurely. Music composer Georg Friedrich Händel said in his manic phase passed just two weeks his most famous work, the Messiah. Two centuries later, the painter Vincent van Gogh probably ridden the same disease during the manic phase tirelessly painted while in one of the deep depression took his own life. A suicide was the likely cause of death, also at another artistic genius, this time from the fields of literature, Ernest Hemingway. It might seem that different mental disorders to the profession of artist somehow belongs, and if necessary, a writer suffering from a disorder, it must quickly obtain some. In fact, it can be reversed: sick soul that no author himself did not choose, trying to find relief through art. And if that's not enough, comes the dark side and creativity, which often destroys its wearer.